It was a must that I attend Nilaja Sun’s performance. After viewing snippets of her performance, No Child… via Youtube years ago, I made a mental note much like those, X amount of things one must do before they die. This event was extra special because not only was I able to cross off seeing a Nilaja Sun performance before I die, I would also be able to give back to a great organization, OneDC. OneDC is an organization based in Washington, DC that provides resources and assistance to D.C.’s most vulnerable residents. To support OneDC’s 10th Anniversary fundraiser, Wolly Mammoth partnered for a special showing of Pike St.
She touched on a growing problem that residents face in the district that is smothered by businessmen disguised as landlord, striking deals all over the city in an effort to make millions on the backs of the districts most vulnerable residents who are not equipped to fight back. That’s where OneDc comes in, said the resident. “OneDC gave us the resources and guidance we needed to push against these businessmen who had one agenda in mind–to store up their richest via broken promises to city officials who turn a blind-eye to accountability. Huh. Ohh. Damn! Okay, hahah, Omg! Realllllly. HAHAHAHA! Stop-it. No. Yessss. What? Come on. Awww. Yeah, yeah, clap-clap-clap. More-more, clap-clap-clap. Nilaja Sun embodies Gandhi, a 15-year girl, daughter of Evelyn, who suffers from a brain aneurysm that leaves her handicapped. Gandhi is sitting in the chair while different sounds from Pike Street enter the space. 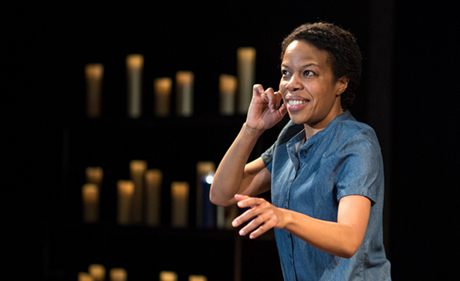 Once introduced to the audience through a series of twist and turns in the living room of her families apartment, Sun switches to Evelyn, Gandhi’s mother who is standing over Gandhi praying and willing Gandhi out of her state of handicap. Soon after Evelyn is on the phone trying to get assistance as the family anticipates that New York City will be slammed with a storm that may cause power outages. Due to Gandhi’s life-sustaining equipment, Evelyn needs to be prepared ahead of the storm. Mrs. Applebaum is an elderly neighbor who comes to visit. Aside from her dementia-like signs, she seems to have the mind of her youth when it comes to Evelyn’s brother Manny, a decorated war hero that enters with a bang later in the show. Evelyn’s father Popi, is a hoot. He enters true to life of a grandpa who is confident about his spell on woman. He soon convinces Evelyn to go to the store while he entertain his lady-friend for a whopping 40 minutes of fun (*wink-wink). When Popi’s girlfriend enters she is given a list of things not to do by Evelyn, which she ignores as soon as Evelyn is out the door; she blows smoke in Gandhi’s face and she turns the t.v. to the Price is Right. Popi enters with one thing on his mind and the audience is then treated to Sun’s exchange between two naughty elderly individuals who play on each other’s emotions. While Evelyn is away at the store Manny, enters the scene. Popi is back in the room getting it on, literally. Manny yells out for Evelyn and Papi while loving up on Gandhi suffering in silence from the Price is Right before Manny realizes and turns the channel. It is during a stroll to the store that the audience witness the toll that war-life has on Manny. Walking with a long ago friend, they past under a train that sets Manny on a flash-back. Sun plays the part and her performance paints a picture that spills into the mind and hearts of the audience of war vet who suffers from post-traumatic stress disorder. More heartbreak unfolds when Manny goes back to the apartment and demands answers about his mother’s death from his father. Popi breaks down and we soon learn all the details about this family on Pike St. The storm that had been brewing over the course of the performance touches down and the family is scrambling trying to turn on the generator for Gandhi’s life-sustaining equipment. Somehow Gandhi is locked in the bathroom just as the storm knocks out the power. The apartment is chaotic as everyone tries to figure out what to do. There is a happy, but sad ending to this awesome performance. It’s really over and Sun bows to a standing ovation. That’s all I got. Again, it was awesome and if you’re in the DC/MD/VA, please go and check out this performance. It will be running until April 23, 2017 @ Wolly Mammoth Theatre (85 mins, no intermission). My Affirmation in this Space: I embody a world of my own and I will not take it for granted.